The meeting discussed the carbon footprints of conservation organisations. 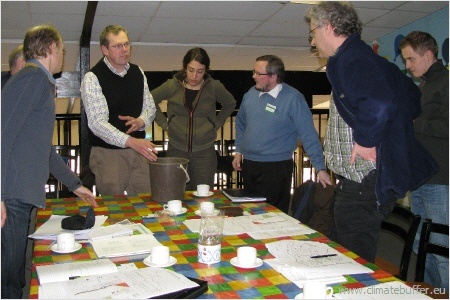 This meeting was hosted by the National Trust and investigated how carbon stores and emissions are being assessed, and how stewardship is being managed, at an organisational, village and farm level. It took place from 2nd to 4th March 2011. The study group went to the National Trust’s central office in Swindon, and two National Trust properties - the Wimpole Estate, which includes a working Home Farm, and the Coleshill Estate where the focus was a Trust-owned village. Further information on the carbon reducing strategies of the partner organisations were given in presentations and speeches. All the participants and invited guests on the Carbon Footprints study visit provided examples of strategies adopted by different organisations to reduce their carbon footprints. For the National Trust Rob Jarman, Director of Sustainability and Katherine Hearn, Adviser on Nature Conservation, presented C-Strategies. Doug Warner, University of Hertford, informed abot at study that linked soil carbon, environmental factors, land-use and farming methods. Olly Watts, Senior Policy Officer, Climate and Peat, of RSPB talked about the oragnisation's C-strategy. environmental monitoring methods in the Conservatoire du Littoral and LPO. Not doing anything internally as yet. Carbon is not measured, but the priority is to help area and ground staff with an Environmental Management System. Existing industry standards, like Bilan Carbone and Ecological Footprint, are being used. Nathalie Swinkels, Programme Manager, Climate Change and Mitigation, informed that Natuurmonumenten’s goal is to be carbon-neutral with compensation by 2010, and carbon-neutral without compensation by 2020. Main strands of work described are a behaviour campaign for staff, modifications to buildings, and production of natural energy (25% now produced). Adaptation methods (an Ecological Head structure, migration zones, climate buffers and changing the nature policy) and Mitigation (the climate-neutral policy, biomass and planting more forests) were discussed.